LM, DC, Ford and I agreed to meet the day after Frieze in Greenwich Village. DC wanted us to see some photographs by Ellen Carey. We went over to JHB Gallery to check out this work. JHB Gallery has been around since 1982--the history of the gallery on its website describes it beginning in Midtown in 82, moving to Tribeca in 84, to Soho in 88 and finally closing the storefront in 95 and working as a private dealer. I suppose after you have built up a network of collectors, at some point the expense of having a storefront is not justifiable. But how do you get new clients? In this case, DC purchased a Carey photograph from a charity auction. I've often wondered if there was something a bit exploitative about charity auctions--I mean, what's in it for the artist, except for good feelings? Well, in Ellen Carey's case, she may have acquired a couple of new collectors. In any case, Baum must be doing something right--she represents 36 artists. Now JHB Gallery is in Jayne Baum's apartment. Like most New York apartments, it is small and uses space efficiently. Two art drawers formed the base for a table with wings that, once opened, became the surface that she showed us Carey's photos. Jayne Baum and her assistant (who I think is also her husband) patiently showed us hundreds of Carey's photos. DC was keen to expand his collection, and once he saw them in the flesh, LM was enthusiastic. 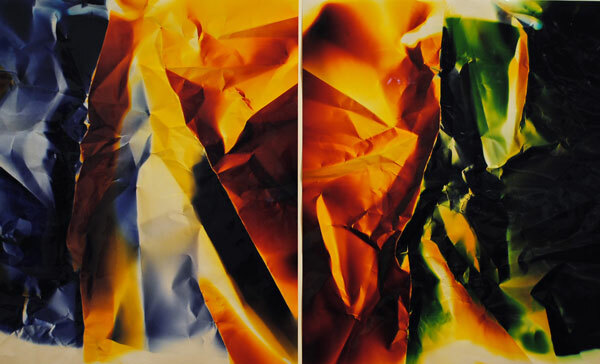 Carey, a professor at Hartford Art School, specializes in photos made without the use of a camera. 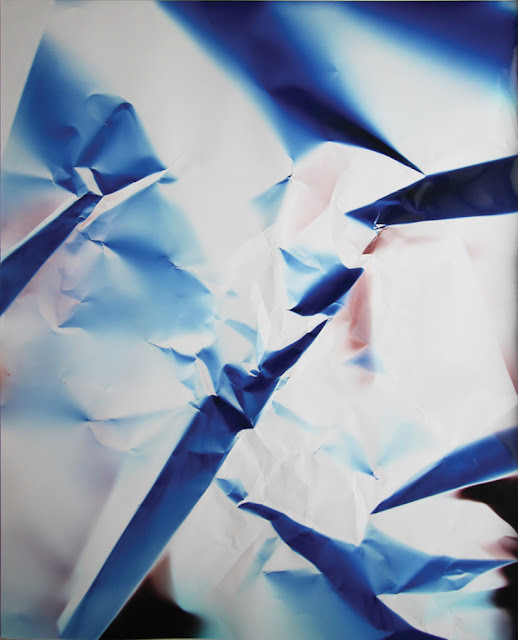 In the Dings and Shadows series, she crumples up photo paper and exposes it from various angles to colored light. The effect is of looking at a deep, intensely colored relief, abstract but with a real sense of space. But seeing them in a reproduction doesn't really give you the true effect. The paper, although it has been flattened, still retains the creases and shallow folds it have from being crumpled up in the first place. So you have the physical deformation of the paper which is extremely exaggerated by the play of color and shadow. They aren't just images--they are beautiful, intriguing objects. As we looked, we discussed each work, talking about the technique, the colors, the design, and so forth. LM and DC would occasionally ask that one be set aside to look at later. We were in that warm apartment for two hours, and they spent that whole time in deep contemplation. The amount of concentration spent on each piece was remarkable. And they didn't buy anything on the spot. But I suspect they will. Baum will send them jpegs of the ones they set aside, and they'll roll it over some more, and then make a decision. Up to now, they had no common artists in their respective collections. But I think Ellen Carey may be their first.